I am sharing something today that is actually extremely important to me, in a good way! As some of you know, I have always had really curly hair, but over the last few years it’s gotten considerably less curly and I am NOT happy about it. I want my hair as curly as possible. I want it as big as possible and as wild as possible! Lucky me, I found a trick to help the curls! A couple months ago I was introduced to this reddit thread called “curly hair”. Basic huh? My boyfriend told me abut it and it honestly changed my life so I was pleasantly surprised. In this thread there are a few very cool links. 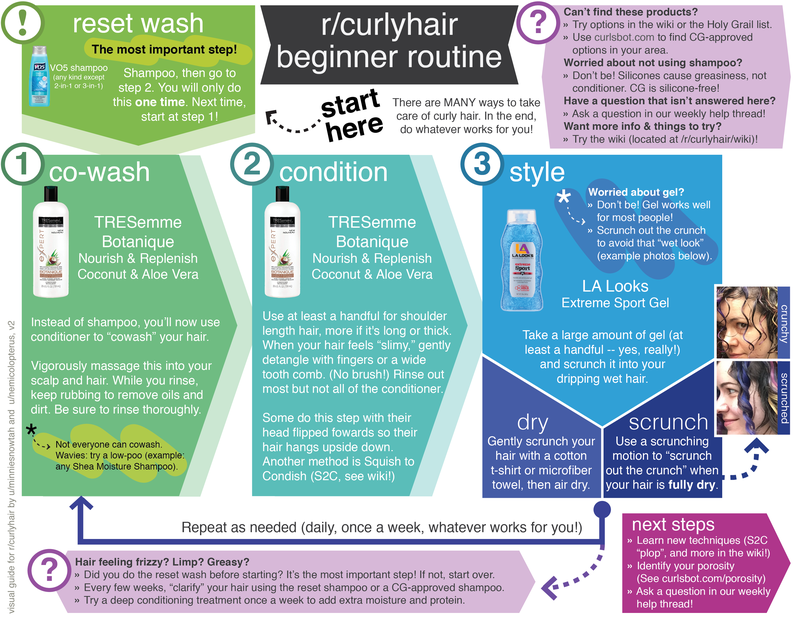 For example there are two step by step guides on how to start the Curly Guy/Curly Girl method, one of which is a photographic version. Second, it has a product list that is THE Holy Grail of curly hair safe products. You’re probably thinking, “wtf, there are so many curly hair safe products” but sorry, you’re wrong. For curls to stay hydrated, healthy, tight and not frizzy they require shampoos, conditioners & other creams or gels that do not contain sulfates or silicones of any type. Most hair products have at least one of those ingredients and that is just a ‘no-no’ for curls. Wash your hair with a sulfate shampoo ( no silicone) and you only do this once. This is the most important part! Use conditioner! Your curls need moisture. This stuff must be curly hair safe, otherwise it will weigh down your curls. If you want to apply styling product go ahead, as long as it’s part of the safe product list. I do not use any product after washing anymore because I wanted to see how my hair reset before I decided if I need product or not. After following this method for a few months, I can honestly say I don’t totally need products. My curls have improved enough for others to notice. Before you start the method you have to pick out your curly hair safe products. Check out the holy grail product list and go from there. Here in Mexico there weren’t many options that were approved, so I went with the Shea Moisture brand. My personal favorite is the Curl & Shine, Coconut & Habiscus line Shae Moisture has. They’re all curly girl approved, but I like the smell and feel of this one the best. Not only is this brand quality stuff, it’s also completely affordable! For anyone that has curly hair, you need to try this method. They say that even if your curls look ok now, when you switch to the proper hair care your curls will be significantly better after 2-3 months. From my personal experience, this is totally true. My curls may not be completely back to how they were in high school, they’re pretty close considering I dyed my hair a lot & even bleached it. For me this has been a fun process and I am sticking to it, looking forward to see how my curls change. I hope this helps you and your curls! I started this whole process back in August. Right before I went to Poland. Here are my before photos where my hair was very frizzy and limp looking. Now three full months later, my hair is not as frizzy and the curls are more defined. They aren’t perfect ringlets like they used to be, but they are definitely nicer than before I started with this method. Here are photos of my current hair status!